The much hyped, but non-successful Americanized version of a YouTube hit, Japanese game show, “Hole in the Wall” will make its return as a family show. Casting is currently underway for a leading kids network (which is being finalized soon), as we got the word straight from the show’s casting department. Fremantle Media North America (Let’s Make a Deal, American Idol, The Price is Right) is currently casting families for the show. Casting stated that “kids and adults will compete”, and they are looking into holding open calls somewhere in a park, family friendly type of atmosphere. Possibly at a theme park or a water park. Specific locations are being locked-down. So far, one show format that is the same is the amount of members in a team. The show will have teams of consisting of three people where one must be an adult (18 or older) and one must be a child (12-17 yrs). They can be family members, athletic teams, teachers, coaches, etc. according to casting requirements. More details to come as we get them. 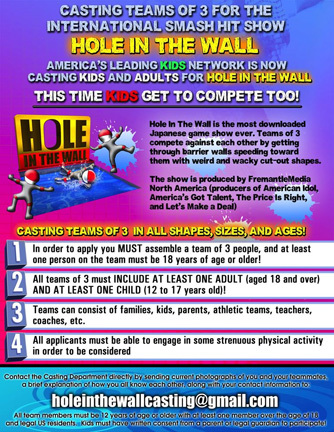 Casting has begun for the return of a familar physical stunt show, "Hole in the Wall".